For today’s bulletin, we take a look at Nike $NKE and provide a link to download a FREE STOCK REPORT on the company. VALUATION WATCH: Overvalued stocks now make up 50.57% of our stocks assigned a valuation and 20.44% of those equities are calculated to be overvalued by 20% or more. Thirteen sectors are calculated to be overvalued. Nike, Inc., (NKE) based near Beaverton, Oregon, is the world’s leading designer, marketer and distributor of authentic athletic footwear, apparel, equipment and accessories for a wide variety of sports and fitness activities. Wholly-owned NIKE, Inc. subsidiary brands include Converse, which designs, markets and distributes athletic lifestyle footwear, apparel and accessories; and Hurley, which designs, markets and distributes surf and youth lifestyle footwear, apparel and accessories. Nike made a big PR gamble last week with the debut of a new ad campaign with controversial former-NFL quarterback Colin Kaepernick. Immediately, the company was besieged by complaints from the White House and customers who began boycotting the company, defacing, and/or burning various Nike products. In addition, the stock took a slight dip on the news. However, since last week we have also seen a sales boost for the company–especially online. The latest reports show a bump in sales in excess of 30%. And, if one considers social media, the PR move seems to be doing the company some good as well. The resultant “meme war” was joined by both sides, but clearly the pro-Kaep forces have been winning there. Perhaps more importantly, with this one PR blitz Nike seems to have –at least temporarily–laid to rest various concerns about wages and conditions in its overseas production facilities, the treatment of its largely female labor, and other issues which were long a concern for socially-conscientious consumers. While some have cautioned consumers about embracing a company with such a shoddy labor record, the company has scored a hit with coveted demographic brackets both in the US and overseas. While demographics may not always be destiny, when it comes to expensive sneakers, Nike clearly understands its market. That market is both young, and largely of color. These are the sort of customers who support Kaepernick and other NFL in their protest against police brutality and civil-rights violations. It remains to be seen how this will all shake out in the long run, but as of now we believe Nike has done itself some good here. 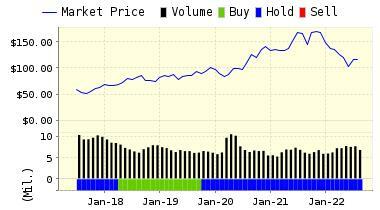 As you can see from the chart below, we have had a BUY on the stock for a while now. We do not expect their latest ad campaign to have a negative effect on their bottom line. After all, every person burning or destroying a Nike product in a fit of pique had to pay for that product first. And, by putting Kaepernick front and center again, Nike has re-energized a key portion of their customer base. VALUENGINE RECOMMENDATION: ValuEngine continues its BUY recommendation on NIKE INC-B for 2018-09-07. Based on the information we have gathered and our resulting research, we feel that NIKE INC-B has the probability to OUTPERFORM average market performance for the next year. The company exhibits ATTRACTIVE Company Size and Sharpe Ratio. You can download a free copy of detailed report on Nike, Inc. (NKE) from the link below.